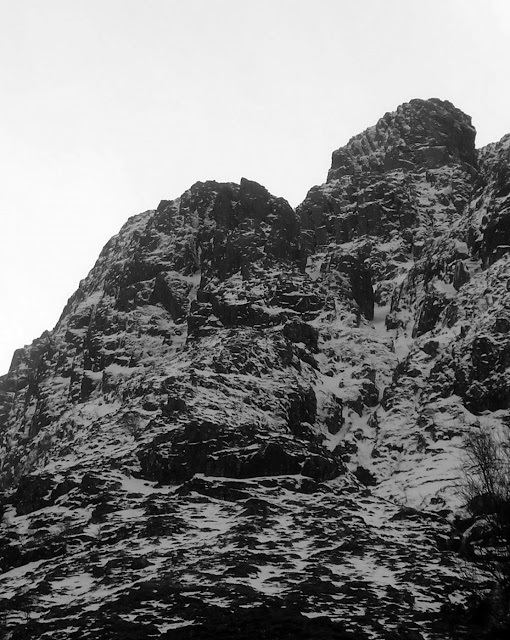 This is my account of a personal experience in the mountains of Glencoe: the closest I’ve ever come to an ‘epic’, or prolonged mountain incident. All dialogue is paraphrased although I believe I have recalled events accurately. Pictures were taken by me on the day. Like most evenings after a shift in the Clachaig, I found myself in the Boots Bar with a pint in my hand, talking about mountains with friends and colleagues. Three and a half pints of Nessie’s Monster Mash swilled around my brain, mixing with stories of adventure and the heady atmosphere of Scotland’s most famous climbing pub. It was a remarkable time for me. My first full winter season in Scotland had started well, despite variable conditions, and I’d done a lot of climbing at the lower grades: Ledge Route, NC Gully, Dorsal Arete, West Buttress, Hidden Chimney. I relished the new scratches on my ice axes although secretly I feared mixed rock and ice climbing, preferring the less technical challenges of snow routes. Mostly I climbed with Jack, the bar manager and a super keen climber, or Isi, who was at that time less experienced than I on winter routes (although she quickly overtook my abilities). Mike, another colleague, intimidated me a little. We shared a love for the hills although Mike’s fitness was formidable, matched only by his boldness and climbing ability. Even before we climbed together for the first time I knew, instinctively, that he was much better than me—and yet I was keen to climb harder routes. I wanted to be able to say I could climb Grade IV. Mike was the obvious man to team up with. We climbed the Central Buttress of Stob Coire nan Lochan early in the month (or at least the bottom pitch; we ran out of daylight and had to take the easy finish to the top). It had felt hard but not in the least bit scary, and Mike’s superior abilities made the undertaking feel less serious than it actually was. So, when he started talking about climbing another Grade IV, I didn’t need much persuading. Both of us were due in work the next day at 5pm, but the route was short and fairly close to the road, we reasoned; what could possibly go wrong? I rolled out of bed early on Wednesday morning. My head pounded with last night’s ale and I gulped down a mouthful of tepid water from the glass on my bedside table. I’d forgotten to pack before going to sleep—a schoolboy error—and I felt lethargic as I stuffed crampons, jumper, gloves, and ice axes into my rucksack. Mike drove us to the car park near the foot of Coire Bheith, a distance of less than a mile. Our route loomed high above us, a tombstone against the grey of the early morning sky. The West Face of Aonach Dubh had cast a spell over me the moment I started working at the Clachaig: such a vast cliff, complex and crinkled into numerous buttresses and terraces, seamed by gullies, glinting with ice. My first climb in the Glen, the previous September, had been a traverse of the B-F Buttress scramble and I found myself enthralled by the vertical gardens of moss and fern, dripping with water that streamed in torrents down the crags to splash, echoing, into gullies where few people ventured. It was a place that I was determined to explore, but I had a healthy respect for the cliff in winter. Under snow and ice it was a place of avalanches and Mountain Rescue statistics. The Pinnacle Face was a relatively minor route climbing the front of B Buttress. From the Clachaig it had no definition: just a flat front of cliff, apparently vertical. From the guidebook I knew that it was in fact a complex outcrop featuring several jutting spires and a variety of steep climbing. In summer condition it had been attempted several times by Clachaig climbers, including Mike and Jack, but had resulted in several defeats with amusing stories (one of them involving a cut thumb and a late finish, as I recall). We plodded up the grassy lower flank of the cliff, wondering why the air felt so mild. The snow underfoot was slushy and made progress awkward as we scrambled up turfy ledges and dug our fingers into the mud to haul ourselves up short steps. The approach to the West Face is always an exercise in gardening, for a verdant carpet of heather, grass, moss, and slime coats every feature until you get to the Middle Ledge. This morning, however, conditions did not seem to be particularly well-frozen and we wondered what kind of nick our climb would be in. The avalanche risk was high. A recent thaw had destabilised the snow pack, and conventional wisdom put the gullies out of bounds. Our climb, however, followed a buttress route. We would be safe. At this point I was not feeling as fresh as I would like before a climb. I was hungover, hadn’t had enough to eat or drink that morning, and my new boots were rubbing. I was carrying a backpack that seemed to get heavier with every step and had climbed out of my bed directly onto a slope of 45 degree heather and moss (or so it seemed at 8 o’clock that morning!) We hadn’t really started early enough, and our progress up the approach hadn’t really made up the lost time. In short, although I was super enthusiastic about climbing, part of me was already looking for an excuse to go home. However, Mike betrayed none of these concerns and I had no wish to appear amateurish or weak. I trudged on. Finally we saw the route. It looked blacker than we had expected. The ethical code of Scottish winter climbing dictates that ‘mixed’ routes (those primarily involving rock climbing) can only be attempted in winter when covered with a decent lathering of snow and ice, to protect the delicate vegetation from our fierce winter weaponry. Axes and crampons have made a mess of some climbs and we had no desire to cause extra damage. Most importantly, the turf and mud had to be frozen to be considered ‘in nick’. ‘What do you think?’ I asked my companion as we paused, breathing heavily, to assess our route. Part of me wanted to claim it looked black and use that as an excuse to go home and back to bed. Part of me worried about the time. Part of me was afraid of the verbal abuse I’d receive from Mike if I gave voice to my concerns. Part of me said I had no right to disagree with a more experienced climber. It didn’t occur to me that Mike was probably feeling just as conflicted. He cared about ethics but was also driven to push his grade and climb hard, and he probably felt just as compelled as I not to show any weakness. We didn’t know each other well enough yet to be completely honest. The different motivations and points of view warred for a moment inside my head as I debated what to say. Cowardice and ego won. Mike was poised halfway up the first pitch, battling with an awkward-looking corner. His right boot was balanced on a ledge of rock that looked depressingly ice-free. Tufts of springy heather deformed under his body as he tried to squirm past the obstacle and out onto the open shelf above. Chunks of ice and clods of grass flew down the pitch and pock-marked the snow all around me. I was attached securely to the mountainside by several pieces of gear and was concentrating on managing the twin ropes (which I had used only once before). I felt like the Michelin Man: padded out in fleece and Goretex, head protected by a helmet (with hood over the top) and ski goggles against the wind, hands encased in huge woollen mittens that made manipulating equipment a chore. The ropes led from the pile on the ground to my harness, which was weighted down with climbing gear. Nuts, hexes, ice screws, slings, pitons and cams added a good few kilos to my bodyweight. It didn’t exactly inspire confidence that I would be able to climb at my physical limit. Thwack. Mike hacked one of his new axes—far shiner and more technical than mine—into a patch of turf, and shifted his balance. Steel scraped against rock. I shifted uneasily. The first pitch didn’t look that difficult, but the vegetated ledges lay under a covering of loose snow somewhere in between porridge and powder in consistency. I tried to ignore the damp sheen on the cliffs. I really couldn’t see any rime ice at all and the snow hadn’t stuck onto the rocks in the way that the pictures in the guidebooks showed. Was this really ‘in condition’? I’d done a lot of climbing at lower grades but nothing involving steep rock except for the crux pitch of Castle Ridge. There was certainly a lot of snow about but the rock seemed awfully bare. Mike hadn’t even put his crampons on for this first pitch. I didn’t want to be accused of climbing a route when out of nick, but turning back now seemed stupid. Despite my conflicting motivations, part of me really wanted to climb this route. Even if Mike wants to retreat, I decided, I will insist we keep going. ‘Maybe the turf will be more frozen higher up,’ I suggested. Mike handed me his sling with the rest of the gear. I took it hesitantly, suddenly full of doubt. The next pitch looked much more difficult than the first one. After overcoming the heathery corner, easy scrambling had brought us to a leftward traverse and a shelf beneath a pinnacle of rock: the first spire on the Pinnacle Face. I looked up the climb. The first few metres seemed vertical to my inexperienced eyes, with patches of snow coating all the holds; after that it seemed to lead upwards to the top of the pinnacle, and beyond that, who knew where? I didn’t really want to lead any of it. Mike had said he would lead. Despite my bravado about wanting to climb harder routes, I had never been much of a rock climber and I found mixed climbing in winter even more difficult. My brain just didn’t seem to cope well with the technical challenge of making the necessary moves to ascend steep rock with axes and crampons. When unsure of a move, I would suddenly realise how precarious my position truly was, and the fear of falling would grip me. I was a much better climber of pure ice and snow. I knew what Mike was trying to do for me. He wanted to let me lead a pitch to increase my confidence. There’s no honour or recognition in seconding a climb; you haven’t really ‘done’ it unless you’ve led some of the route. The conflicted voices in my head quarreled for a bit, and once again to save face I accepted the challenge. I checked the belay, placed a bit of gear as high as I could to protect the first few moves, and set off. Pop! Within seconds I was back on the ledge. A crampon had skated off a hold and I had fallen, only a foot at most, but enough to sharpen me up. My axes sprang from their holds and one of them struck me on the forehead, unbalancing me but not enough to make me fall over. I raised a mitten to my face, and it came away bloody. The adze of my ice axe had sliced open my eyebrow. Instead of putting me off, my little slip had the effect of making me more determined to finish the pitch. I got going in earnest and, after the first few steep moves, I found myself really enjoying the pinnacle pitch. The terrain eased to maybe 60 degree rock and I placed crampon points confidently on the nicely-angled holds, pressing down with my palms and making great progress. At the top of the pinnacle I found a massive rock to anchor myself to and, all said, I felt pretty good that I had led the pitch after all. We had made relatively good progress on the climb until this point, but the final roped pitch was a monster. Mike led the vertical cracked corner up the final steepening of the buttress. Better conditions had failed to materialise; if anything, the route had become even blacker and soggier the higher we climbed. By this time I had no doubts that the route wasn’t in condition. It was bare, wet rock; only the ledges had any snow on them. I wondered what the gullies on either side of our route would be like. Death on a stick, most likely. By this time we had stopped discussing the conditions even though both of us knew it wasn’t in nick and we had made an error of judgement. We wanted to finish the climb. Besides, this was the last pitch, and then we could concentrate on hurrying down in time for our rapidly approaching 5 o’clock bar shift. Mike really struggled on that final section, but I’ve got to hand it to him—he got to the top. It seemed to take a long time and as I watched him contort his body into impossible positions, then give up and try a new method of achieving upward progress, I found myself wondering how I would ever be able to follow him. Crack climbing with ice axes and crampons was a mysterious art to me. Sure enough, I found the pitch desperate. If Mike had taken a long time, I took an age. Every move had to be tried five or ten times before I summoned up the courage to commit to it. Mike held the rope bar-tight above me so there was no risk in the event of a fall, but even so I took a very long time to climb that pitch. The blood dripped down my face and I had to stop on several occasions to wipe it out of my eyes. Eventually it stopped bleeding but I imagined I looked a mess. Part of me was thrilled that I would have a minor but dramatic injury to help evoke the story of the day. During that miserable struggle I lost my pretensions as a climber. I realised I would never be a hard winter warrior. Mixed climbing was simply not for me; I didn’t have the head for it, and if I was unable to cope with seconding a single pitch of Grade IV, how would I progress? I swore to stick to what I enjoyed best: the open snow faces and the icy gullies. Finally I arrived at the belay. I hadn’t noticed how quickly time had been passing. Darkness had started to fall, and far beneath our location the lights of the inn twinkled like a distant constellation of stars. ‘Christ, that was hard,’ I gasped, hardly able to raise my ice axes. Mike was brisk, businesslike as he sorted the gear. He seemed preoccupied, and as I recovered from the struggle I looked beyond the top of our route into the vast amphitheatre of snow overhanging No.2 Gully. Our escape route from the West Face looked utterly lethal. I had to agree. The normal route cut across the bottom of No.2 Gully Buttress, traversing open slopes laden with thawing windslab. It would be tantamount to suicide. If we triggered an avalanche, we would be swept into the funnel of No.2 Gully and be dashed to pieces in the ravine 1500 feet below. As soon as I gave words to my idea I knew it wouldn’t work. The light would fail soon—it was practically dark already—and in the middle of the Rake was a terrible obstacle, the Great Slab, an enormous plate of rock slanted at 40 degrees and strewn with unstable rubble. In the present conditions it would be even more dangerous than our original route. Mike phoned Tall Alex, on duty at the Clachaig, and appraised him of the situation. We were advised to stay safe at all costs and not worry about making it back in time for our shift. We agreed to check in as soon as the situation changed. ‘Well, this was poor planning,’ I said light-heartedly, trying to make the best of our situation but feeling increasingly worried. We had been so pleased with ourselves for selecting an avalanche-safe route for the conditions, but had failed to give proper consideration to our descent. ‘We will have to abseil back down the route,’ Mike decided. I had done multi-pitch abseils before in the Alps, but this felt different. This time it was dark, getting increasingly cold, and we were already late for work. I was exhausted and Mike spoke little, irritated I suspect by our cumulative errors of judgement. Our lives would depend on the next couple of hours. Mike made sure the first abseil anchor was secure, choosing (if I remember correctly) a sling as the main anchor with a nut as a backup. He connected the two ropes together with a double fisherman’s knot and coiled them (doubled, so that we could retrieve them for the next abseil) before throwing the entire mass down the pitch into darkness. I don’t remember who went first, but I do remember feeling relieved that we were making progress. As I abseiled back down the pitch I had found so ferociously difficult to climb a few minutes before, my mind chewed over different ways I might have climbed it more elegantly. Although we had climbed the Pinnacle Face, it still felt a bit like a failure to me because I knew I had struggled and flailed on the end of the rope. It was only thanks to Mike’s abilities that we had got to the top at all. We reached the ledge. Mike tried pulling the rope through, but it got only a certain distance before sticking on something. I switched on my headtorch as he cursed his ropes, yanking them first one way and then another, trying with all his strength to retrieve them. I tried for a long time to retrieve the ropes. At first I thought the knot had got stuck in the karabiner, but even pulling the ropes through the other way did nothing. They must have got snagged in a cleft in the rock somewhere, I decided, although eventually after much jumping up and down and pulling, I managed to feed through half of the doubled 100m line. We decided to cut our losses. Mike climbed a little way up and untied the knot. The first rope, hopelessly jammed, was left draping the upper pitch of the Pinnacle Face. Mike had spent a small fortune on these ropes only a few weeks before. So, now we had only one 50m rope to use doubled to get back down. The decision was made to avoid the pinnacle and all the weaving back and forth beneath it. It would involve too much diagonal abseiling, I argued, and would increase the risk of losing another rope. Mike agreed silently. By this time we operated automatically, doing what had to be done to get down, communicating rarely, both thoroughly disgusted with ourselves for our mistakes. Running along one side of the Pinnacle Face was a small chimney and rib that we thought might offer a safe route off the cliff. Our current task was simple, or so it seemed: find a way down into the chimney. Of course, it was dark by this point and our headtorch beams illuminated a confusing fractal of ice, snow and rock, up and down all jumbled together. The next abseil was the most terrifying of my life. Mike went first, abseiling diagonally to aim for the next safe platform. Our anchor was suspect at best, formed from threading a length of 6mm cord through a constriction in a crack. I am honestly amazed that it held, but hold it did, and a few minutes later I heard the call of “ROPE FREE!” from Mike. I stepped into the void. Gravity urged me straight down, but I knew I had to go left, so I crabbed across the iced slab. Tension built up in the rope. With every sideways step I took, I had to exert more effort to remain in contact with the wall, until finally the forces were so powerful that I had stop and slam both of my axes into soggy turf just to remain in balance. If my crampon points lost contact with the wall, I would be catapaulted across the slab to be smashed unconscious against the far buttress. I kept going while I had strength left. Somehow I made it down to the chimney where Mike waited for me in waist-deep snow. Guess what? The second rope jammed and was unrecoverable. Once again we both tried our best to dislodge it, but once again it became hopelessly wedged, no doubt thanks to the diagonal line of our abseil. The final part of the climb, down a narrow gully filled with bottomless snow, was awkward and unpleasant but hardly dangerous. We dropped down numerous small steps which appeared nothing at all from the top, but proved to contain a metre or so of thawing snow on top of a layer of slime. When we finally regained the safety of the Middle Ledge, Mike phoned back to base to keep them up to date with our situation. We were informed that friends and colleagues had been watching our lights on the cliff, keeping tabs on our location and ready to call Mountain Rescue if the lights should stop moving for a long period or vanish altogether. We descended the steep rough ground of B Buttress as best we could in our exhausted condition. I don’t recall speaking a word to each other until we finally got back to the car. Wile I stood in a stupour, Mike dumped his rucksack on the ground, exhaled loudly, and swore to sell his climbing glear—or at least what remained of it, for a good proportion of it had been left behind on the cliff to safeguard our descent. We returned to the Clachaig as the bar was closing up for the night. As I recall, we didn’t speak much about the Pinnacle Face for some time. Both of us considered the route ‘climbed’, but I certainly didn’t consider myself a Grade IV climber—and we both thought long and hard on the lessons the Pinnacle Face had taught us that day. I believe we both matured as climbers because of the incident, and in my case it (perversely) consolidated my fascination with the wild terraces of Aonach Dubh. Both of us had escaped without injury (except my slight eyebrow cut), and in the circumstances I thought us extremely lucky. The outcome could have been so much worse. We could have risked the No.2 Gully amphitheatre and been avalanched, or we could have made a mistake on the abseil and fallen to our deaths. Who was to blame for the accumulation of errors and poor judgement that led to our shambolic descent? I think we were both equally to blame. We egged each other on, convinced each other that the route was in condition (or might just be in better nick a bit higher), believed that we’d be able to complete it efficiently and in time. The truth is that we weren’t an equally matched team, and our collective egos blinded us to the warning signs we should have heeded much earlier. The price we paid—our pride, a little blood, a missed shift each, and a portion of Mike’s climbing gear—was worth paying for the experience and the lesson. The mountains are good teachers, if you listen to what they have to say, although they are certainly not gentle in administering their lessons. I never climbed the Pinnacle Face route again, although Mike returned and climbed it in summer condition later that year, pronouncing it a far more enjoyable climb when free of snow and ice! His ropes, and the rest of his gear, remained on the Pinnacle Face for some months before they were salvaged by another climber. I climbed with Mike again on several occasions and we remained friends, although we nearly came to grief a second time on the North Buttress of Buachaille Etive Mor a year later!